Is this just too painful? I have been meaning to paint it for years from the photos I took during a perfect sunset Circle Tour on my first trip to New York in the late 80's. Every time I look at my pictures I am saddened and still incredulous. That's just absolutely gorgeous. You're an amazing gal. BTW - about that heartbeat thing on the Monterey Peninsula? I KNOW there's a house just waiting for you. no, it's not painful- it's actually a little comforting. 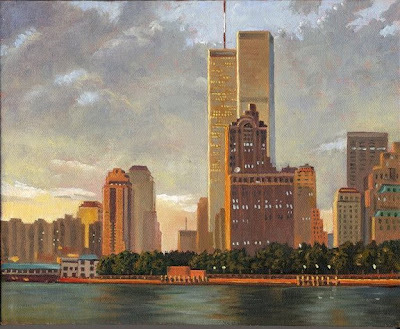 I grew up in NJ and NY and when i learned to drive a thousand years ago - I would often get lost- so I would just look around and find the Towers and I could then figure out where I was - in relation to them - I felt so lost for so long after they were destroyed. My little town here where i live lost many people there on that day...we have a memorial in our town park that I pass almost every day, so it's still heavy in many hearts.